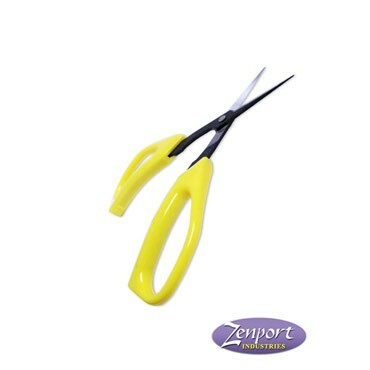 The Zenport Ergonomic Bent Handle Deluxe Trimming Scissors. 6.5-Inch long, slim blades are razor sharp and make it possible to pick fruit and remove culls in even the most crowded situations. Very popular for harvest trimming and propagation. Soft bow grips fit any hand, reduce fatigue, and can be used by lefties. Blades made of carbon steel.